I HAVE been an Army wife for almost 16 years. Dave was already in the military when we met through my brother, who he served alongside in the Royal Green Jackets, now known as the Rifles. 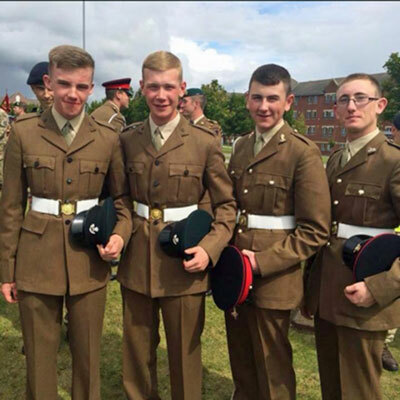 We have three amazing boys – Jacob (17), Charlie (12) and Billy who is five – and are currently living at Catterick Garrison where Dave is part of the Infantry Training Centre and our eldest is a recruit. Jacob first told us he wanted to be a soldier “just like his daddy” at a very early age. I thought it would be a phase that all little boys go through and was awaiting the next one, be it “I want to be a policeman” or “I want to be a fireman”, but they never arrived and he was determined he was going to join the Army. When the time came for Jacob to seriously think about his career path, he still insisted on joining up. I had spent years worrying about Dave as he went off for tours of Iraq and Afghanistan and have to admit I didn’t want to spend more years worrying about my son too. I’m his mum, he’s my first born and it’s my job to protect my kids and keep them from harm, so why would I want him to go to war zones? With persuasion from Dave, I agreed to let him join the Army Foundation College Harrogate. It was a good compromise as he balances military training with his education. The day he left for Harrogate was heart-breaking. I wasn’t allowed to take him as he told me I would embarrass him so it was the job of Dave and Charlie. Life was strange, adjusting to making meals for four not five and smaller washing piles, although he now makes up for it when he’s on leave! We went to visit him six weeks into his training and I could see how happy he was and he had made some great friends. I’ve seen Dave and Jacob’s bond get stronger as they have so much in common now – there’s always lots of talk of Army life when they are together. The worst thing about being an Army wife and mum is the goodbyes. The constant worry if they’re okay and safe, and if they’ve had a decent meal. But I am the proudest wife and mum. I love telling people about “my boys” – they do the bravest job and I am so lucky to be able to say “he’s my husband” and “he’s my son”. Over the years I have learnt to cope with what Army life throws at you. If I was to give advice to any new spouses or parents, I would say support your loved one as much as you can. For couples, always talk to each other; it’s a tough job being a soldier but it’s also a tough job being a partner of a soldier. You spend your life following them around the world and being at home with the kids while they are away but it’s important to find time for yourself too. I have a great career and it’s just what I need to keep my independence and to be someone my boys and Dave can be proud of. For mums and dads, you have to keep the contact going. These lads and lasses are hopeless with that stuff. Although they have probably texted a dozen friends that day and not thought about dropping you a line, they need to know we think about them. Be prepared for them spending most days catching up with their friends when they come home on leave. They might be at home less than you expect and it’s usually to be fed or to sleep, but knowing they have a supportive family waiting for them is enough. Once they start their Army training, our babies become men and women. They are soldiers, prepared to fight for their country. Jacob may be a young man but he will always be my boy and will always need to be told I love him.